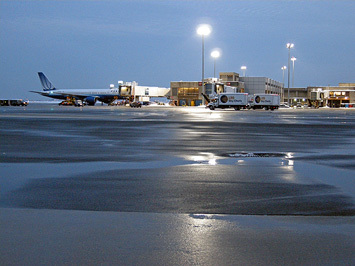 D. Clifford Construction has paved runways and the Interchange (above) for Logan Airport in Boston. D. Clifford Construction is a Massachusetts-based commercial and residential company that’s been in business for more than 30 years. They specialize in asphalt paving and handle large scale projects ranging from runways to roadways, highways to high school parking lots. D. Clifford Construction is a Minority Business that works closely with general contractors. They are one of the state’s approved vendors for critical infrastructure entities such as Massport/the MBTA and Mass DOT (Department of Transportation/Highway Department). Jim Reger, General Manager, is a veteran in the field and former president of a multi-state operation. After serving as a consultant for D. Clifford Construction, he joined the company full time. As many clients do, Jim connected with Datasmith Network Solutions through word-of-mouth. He had “heard good things” about Paul Smith and his team, and set up a meeting to talk. D. Clifford paid for hardware and software, but as part of their service, Datasmith consolidates monthly Cloud-related service fees, so D. Clifford has to deal with only one invoice. “This is a hosted IP PBX system,” Paul Smith of Datasmith explains, pointing out the automated features and high degree of functionality. “PBX” ( Private Branch Exchange) refers to a telephone exchange that serves a dedicated business or office as opposed to a phone company or common carrier that serves the general public. “IP” refers to part of the VoIP (Voice over Internet Provider) terminology. Industry sources cite others IP PBX benefits too, including easier installation and management, cost saving, less wiring, scalability, and better customer service. “The Scan Fax in itself is a godsend,” says Jim. “Now we can transmit 15 faxes in 3 minutes rather than 3 hours, and we can photocopy with the touch of a key.” In a business that relies on moving plans and documentation, this functionality is essential. The move to all-digital ushers in a paperless workflow for D.Clifford Construction. This solution increases productivity by enabling content sharing, thus eliminating the need to print, edit, and file documents. Even better, all documents can be accessed from smartphones and tablets, greatly facilitating ease of use in the field. To prepare your business for the future, contact Datasmith for a free systems analysis.